It's not like the Power Pack to stand idly by when faced with adversity, whether it's super-powered or natural in origin. And so it should come as no surprise that, when their grandmother's health takes a turn for the worse, they don't stand idly by and well up with tears. Instead, they take the second most natural course of action: to seek out Thor in his mythical abode up in the sky. The kids are after an enternal life-giving golden apple, one which only grows in the kingdom of Asgard. As idiotic as this premise may sound, it took me all of four pages to become completely engrossed. There's something about the innocence and honesty of these four siblings that's both appealing and unusual. How many times have we seen a Marvel character traverse the rainbow road to Asgard without questioning its feasibility? Better still, why did it take a twelve-year-old to ask such an obviously natural question? Alex Zalben does a fantastic job of establishing the Power Pack as an instinctively inquisitive bunch of youngsters without rendering them wide-eyed and brainless along the way. These kids certainly aren't as mature as your average Marvel superhero – therein lies a lot of the fun of watching them, actually – but that doesn't mean they have to babble like idiots. Zalben could never be accused of overwriting this issue, either. It's light fare by design, which is right in line with the simple, matter-of-fact tone embraced by both the plot and its key players. Reading this issue was akin to watching a Miyazaki movie: friendly and exciting enough to hook a younger audience, but attractive and intelligent enough to also appeal to their parents or older siblings. It's a great example of what many fantasy stories strive to be, allowing the wild concepts and engrossing adventures to take center stage without a lot of competition from dialog bubbles or elaboration. Almost synonymous with the Power Pack by now, artist Gurihiru has been associated with the kids for the vast majority of their return from hiatus. His sleek, excessively simple style bears a strong manga influence, but also manages to work in a nice set of traits borrowed from modern western cartoons. That results in a flavor that's perfectly matched for the innocent, happy-go-lucky tone of most of the team's adventures, including this one. His take on Thor isn't the best I've ever seen, as I don't usually think of the God of Thunder smiling broadly on every page like He-Man in a winged helmet, but that's a fairly minor complaint. During the frequent action scenes, Guri's work is explosive and entertaining. In quieter, more storyline-focused panels, he keeps things light and playful with a few well-timed background gags. He and the four children at the epicenter of this series were made for each other. 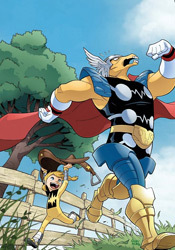 Thor and the Warriors Four is the rare example of a book that's exactly where it wants to be. It doesn't strive to be more, instead it's perfectly happy just getting better and better at being what it is. Most readers will see this cover, read the title and move on, which is fair. It's not for everybody, but it's probably a much better fit than most readers would suspect. Give it a chance, I'll guarantee it's far better than you think it is. Buy it.